In this article I’ll show you how to use the Auto-submit Form feature. 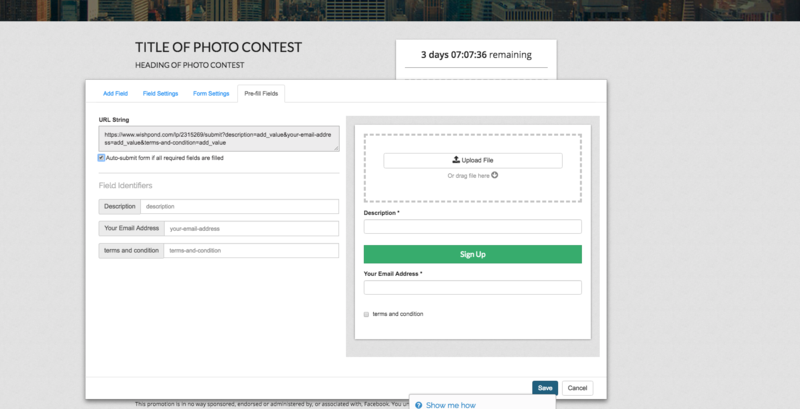 In the Contest Editor, click on your Form to select it. 4) In the Settings tab, you will see the unique landing page link to use to pre-fill your Form Fields and a label for each field in your form. In this URL, for example, you can see ‘Email’ for the Your Email field. We will need the Pre-fill link for our Auto-submit feature. 6) Next, in order to use the Auto-submit feature please check the box that says “Auto-submit form if all fields are filled”. 8) Next, replace all of the “add_value” placeholders with the data that corresponds to each field. This means that when a person clicks on the Auto-submit link in your email it will not only pre-fill the entire form but will also submit them automatically so they don’t even need to click on the Submit button on your Contest form.